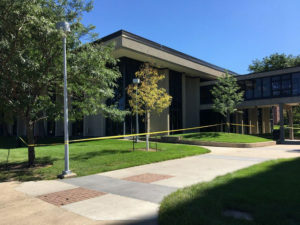 There is warning tape around the Rialto Dinning Center at UNI. A worker at the University of Northern Iowa in Cedar Falls died today in an accident. University Relations Interim Director Aaron Clingingsmith says the accident happened at 8:39 A.M. at the Rialto Dining Facility. “We had a steam leak here on the campus at the University of Northern Iowa. The leak sadly took the life of a dedicated facilities management team member,” Clingingsmith says. He says the employee who died has been identified as 61-year-old Kevin Bley. Bley had been a UNI employee for 10 years working as a steamfitter. Clingingsmith says a steam leak at the Rialto facility on September 4th set off the building sprinkler system and did extensive damage inside the building. He says the facility was closed after the damage was done and Bley was working on the restoration of the building when the accident happened today in the steam distribution area. Clingingsmith says the steam system runs in a tunnel, but he is not exactly sure where the system runs. Clingingsmith says the problems with the building have not led to any issues for students. “They are currently using other dining facilities on campus. So, from that perspective it’s not causing a lot of problems being off line at this juncture,” Clingingsmith says. Other details on exactly what happened to Bley are not yet available as investigators continue looking into the accident.